The Vulcan ship is waiting static in the centre of the board with all weapons armed so as to give the Suliban a warm reception. The Tholian vessels appear on the left of the map, speed 10, weapons and defences fully armed in formation of choice. The Tholians do not want a war with the Vulcans, so they should only disable and not destroy the D’Kyr. A vessel is considered disabled if it is unable to manoeuvre, or if all weapons and impulse thrusters are disabled. Its warp drive must also be damaged. A major victory is accomplished if the Vulcan ship is disabled. A minor victory occurs if it is destroyed or driven off. Both of these are dependant on a Tholian ship being mobile at the end. A major victory is accomplished if the Tholians are driven off or disabled. A minor victory if the Tholians are all destroyed. The D’Kyr must be mobile at the end of the scenario. 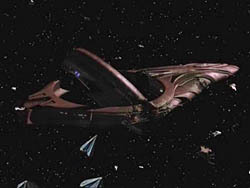 The Vulcans suddenly came under attack by multiple Tholian vessels and were heavily damaged. When the Enterprise finally came out of warp, still under attack by the Suliban, they found the D’Kyr to be completely disabled. They also found a squadron of Tholian vessels. The Tholians and Suliban set upon each other, with the Tholians ultimately finishing victorious. The Enterprise crew had no option but to surrender the future vessels, but not before booby trapping it. However, before the Tholians could take the vessel it was retrieved by someone in the future.